Notes: Fats Domino was a late cancellation. Lionel Richie was moved over into Fats' slot on the Acura Stage. Sam Moore's set was extended to cover part of the slot vacated by Lionel's move. Nicholas Payton also cancelled. 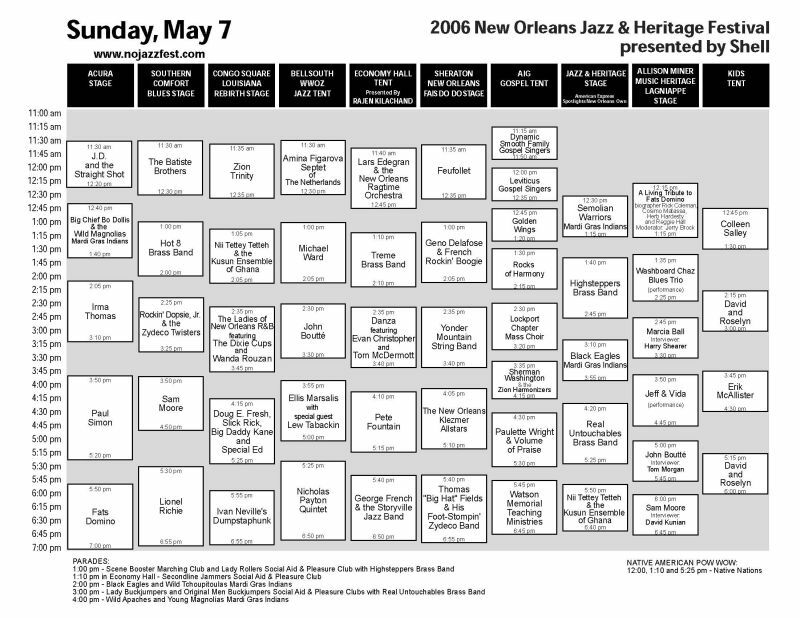 That slot was filled by the "Takin' It To The Streets - Jazz Fest Finale Jam", an impromptu set featuring James Andrews, Glenn David Andrews, Maurice Brown, John Boutte, Christian Scott, Roderick Paulin, Craig Klein, and many other members of Dirty Dozen, Rebirth, and other brass bands. Slick Rick did not perform.